This article was written for a Dallas newspaper by Charles Kilpatrick, Special Writer. 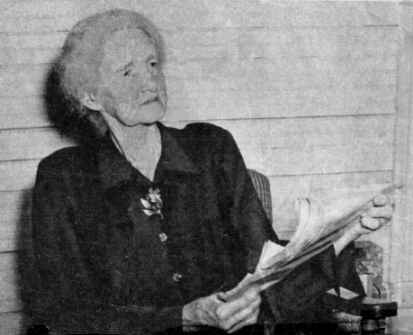 There is no date on the yellowed newspaper clipping but it was likely written in 1949 since it states that Mrs. Partlow, born in 1869, was 80 years of age. It gives many details of what happened there after the 1838 Massacre. The photograph and caption at the bottom of this article also appeared with it. The massacre occurred on October 5, 1838, when a band of renegade Indians swept through the Killough community, a few miles north of what is now Jacksonville, and decimated the families of Isaac Killough, Sr., his four sons, Allen, Samuel, Nathaniel and Isaac. Jr., and two sons-in-law, Owen Williams and George Wood. It was this piece of treachery that caused the final expulsion of the Cherokees from Texas soil. As word of the massacre spread, public indignation rose and action was demanded to end the threat of Indian reprisals. President Mirabeau B. Lamar ordered the Cherokee leader, Chief Bowles, to leave the state and when he refused, troops were ordered into action. Less than a year after the massacre, the Cherokees met crushing defeat in an engagement in Van Zandt County and were sent fleeing into Oklahoma. Chief Bowles, a tall, blue-eyed half-breed, fell on the field of battle wearing a silk vest, crested military hat and sword and sash given to him by his friend, Sam Houston. An Indian uprising (earlier) in 1838 had driven the Killough settlers from their homes but Isaac, Sr., had negotiated a trade which would allow his people to return and harvest their crops. One afternoon's work remained on October 5 when the men left for the fields. In a nearby creek bottom, the men walked into the ambush. Painted redmen shot down Isaac, Jr., Allen, Samuel and George Wood, then swept uphill into the little settlement. Isaac, Sr., fell in his front yard and Barakias Williams was killed in front of the screaming women. Eight settlers, including seven women and children, were seized by warriors and carried into the forest. They were never seen or heard of again. Two of them were 17-year-old girls who fearfully held hands as they were led away. Nathaniel Killough and his wife (and 11 mo. old baby girl, Eliza Jane) escaped into a canebrake and Mrs. Samuel Killough, Mrs. Isaac Killough, Sr., Mrs. Isaac Killough, Jr., and the baby William also managed to elude the redskins. Three weary days later the little party staggered into Fort Lacy at Alto, 40 miles south, where they found safety. Mrs. Narcissa Killough, who carried her (12 mo. old) son, William, to safety in spite of her weak 94-pound body, always maintained that Mexicans and at least one white man were members of the raiding party. After Texas troops drove the Cherokees into Oklahoma, Nathaniel Killough returned to the settlement and rebuilt his home from the charred ruins. By 1846 a townsite (nearby and named Larissa) had been laid out. Settlement of the country then progressed peacefully and quickly. Years after the tragedy, Narcissa Killough dictated her memoirs to her son. It is this handwritten account that Mrs. Partlow holds today (see photo at top of page). last Indian uprising on Texas soil. At the time (1949), the graves, and monument, erected in 1933, were not being cared for by anyone. It was overgrown with trees, bushes and weeds and difficult to find in the forest. 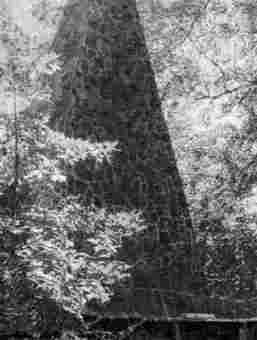 Mary Partlow told Allen Killough where to look for it in 1953. The Killough Reunion Association, formed in 1955, made the care and preservation of the cemetery one of its primary goals. The company that owns a large piece of land there gave that area to the Killoughs "in perpetuity" as long as they maintain it properly.